Salted caramel molasses cookies are chewy molasses cookies stuffed with salted caramel dark chocolate candies. The perfect Christmas cookie recipe! 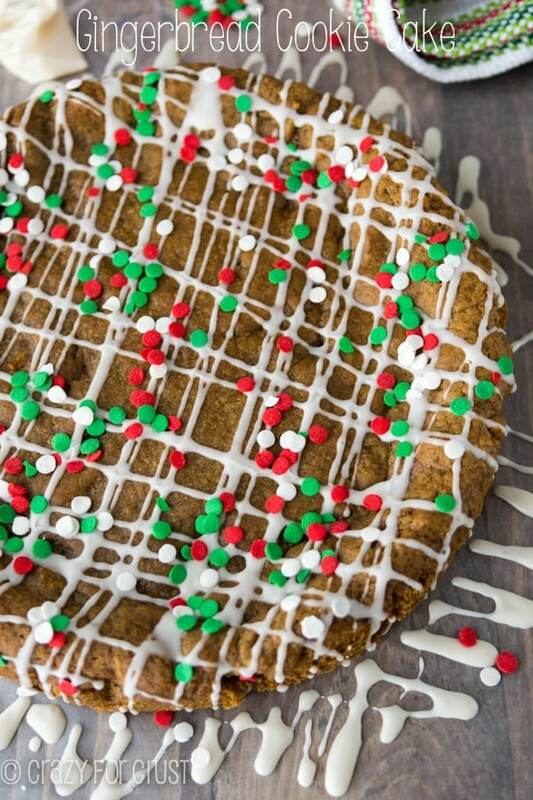 Now that Halloween is over and we’re on the express train to Christmas, all I can think about are molasses cookies. Naturally, I made myself some…and I stuffed them with salted caramel chocolates! 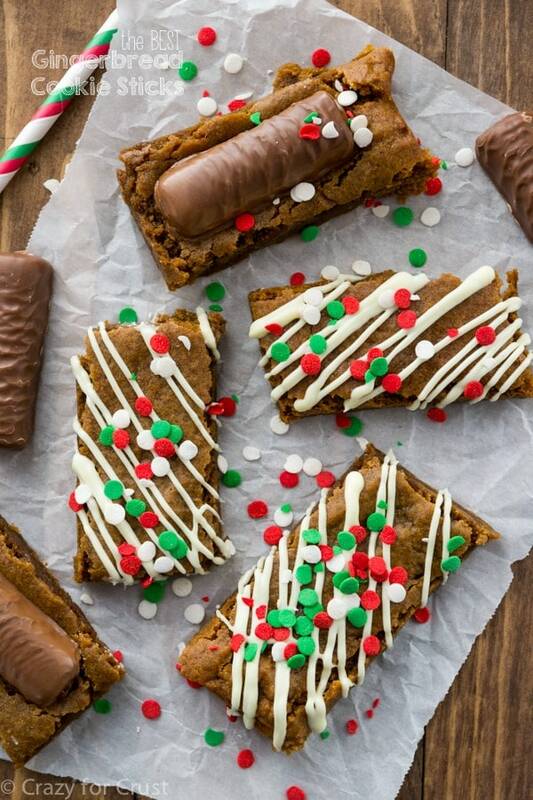 Okay, so is there a difference between molasses cookies and gingerbread cookies? As far as I can tell, they’re the same thing except for how they’re presented. Gingerbread cookies are cut and baked and frosted, where molasses cookies are rolled in sugar like drop cookies. Either way you make them, gingerbread molasses cookies are my absolute favorite cookie – ever. I could eat them all year long (and I often do). 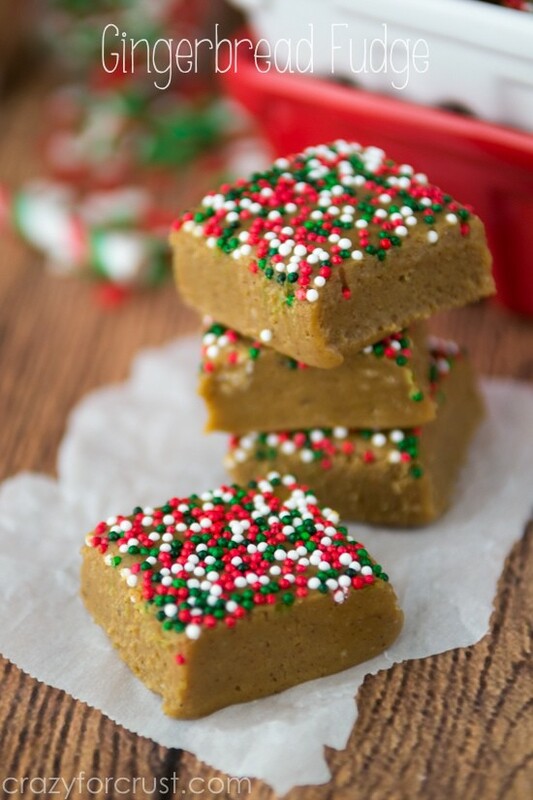 There’s something about the richness of the molasses and the spiciness of the gingerbread spices that just call my name. Every year about now I start to get so nervous about the holidays. You guys, how did it get to be NOVEMBER already? Thanksgiving is two weeks from today. Christmas is just a month after that. I haven’t done anything. I haven’t shopped or made lists or taken Christmas card photos. And I’m hosting Thanksgiving…so there’s that. These salted caramel molasses cookies are one of the things in my freezer. You’re welcome, family and friends! Speaking of cookie exchange parties, have you ever had one? I’ve been to a few. I always mean to host one but never do. 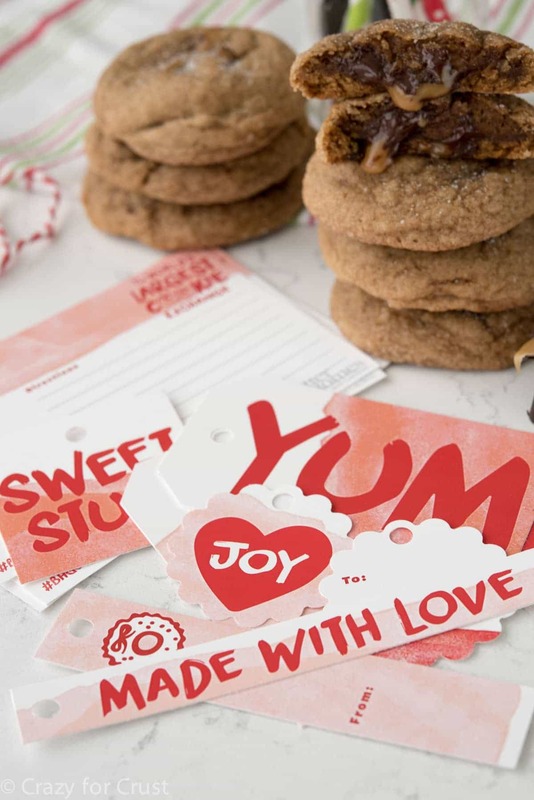 If you happen to be going to a cookie exchange party, check out these printables over on the Better Homes & Gardens site. Aren’t they cute? They even include recipe cards! When they’re warm and you cut them in half the caramel oozes out. That’s a happy, happy thing. I like my cookies a little under-baked. If you like them more done, bake them on the longer side of the time range. Any caramel candy will do if you can’t find the Dove ones. There are lots of other options in the candy aisle, including Hershey’s Kisses and Rolos. It is VERY important that you do BOTH chilling steps. This dough is very wet, which results in a gooey soft cookie, but they’ll spread too much if you don’t chill them as directed. 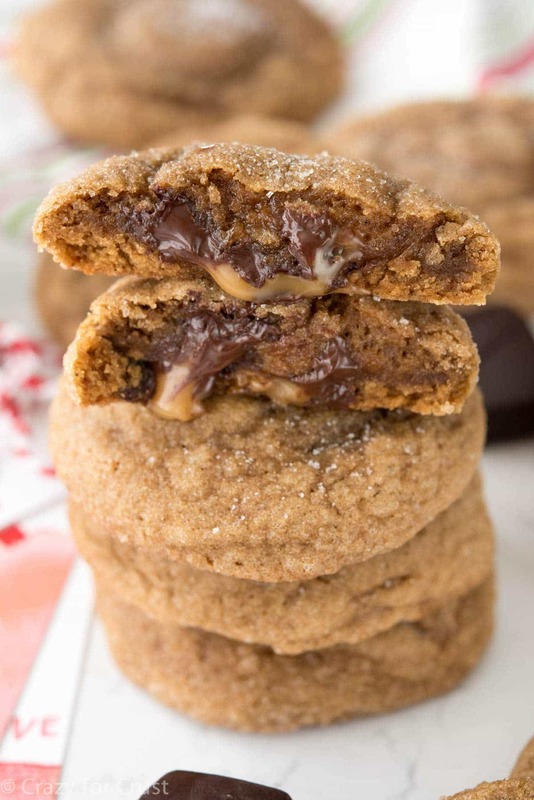 Salted Caramel Molasses Cookies are the perfect Christmas cookie! They're soft with gingerbread flavor and stuffed with a salted caramel chocolate candy! Cream butter and sugar in the bowl of an electric mixer fitted with the paddle attachment. Add molasses and mix until mixture is smooth. Add eggs and vanilla and beat until combined. Mix in baking soda, salt, ginger, cinnamon, nutmeg, cloves, and flour. Mix until a smooth dough forms. The dough will be very soft. Chill dough for 30-45 minutes, or until you can handle it without it sticking too much to your hands. Scoop 2 tablespoon balls of dough. Place a candy in the center and wrap the dough over it, rolling between your hands to form a ball. Make sure the candy is not showing. (Alternately, you could scoop two 1-tablespoon sized balls of dough, sandwich the candy, and roll into a ball. Do whichever method you prefer.) Place cookie dough balls on prepared cookie sheet. You don’t need to space them out at this point, they’re getting chilled again. Chill dough for at least 2 hours. Preheat oven to 350°F. Line a second cookie sheet with parchment or a silicone baking mat. Split cookie dough balls evenly between the cookie sheets. These will spread, so I only put two per line. Place any leftover dough balls back in the refrigerator to chill until you’re ready to bake them. Bake cookies for 11-14 minutes, until they are no longer glossy in the center and the bottoms are just getting golden brown. I like to err on the side of underdone cookies, but that’s preference. Bake them towards the longer side if you like your cookies baked more. Cool completely before removing from cookie sheets. Store in an airtight container for up to 4 days or freeze for up to 2 months. I used to hate molasses until last year! I made these gingerbread chocolate chunk cookies and fell in love!! & then this year I made them with raisins and I was so surprised that I loved them too! I’m certain I’d love these as well – they look unbelievable! Maybe I should try raisins…maybe I’d be surprised too! Ha! Well you are way ahead of me girl! I’m jealous of your freezer full of cookies and bars. I still don’t even know my Thanksgiving menu yet. So I think you’re doing just fine! This cookies looks pretty stellar. Molasses/gingerbread are my favorite this time of year. And yes they have to be soft – not crunchy! Yeah… these are KILLER. I love gingerbread and caramel together for some reason – it’s just a combo I really love, and these cookies look so divine with the melty caramel in the center + CHOCOLATE! Yes!!! The express train to Christmas is no joke! Where the heck is October and November go?!!? And why have I baked nothing?! You must have a gynormous freezer! lol I’m lucky if I can stash some pie crusts and chicken breasts in mine. These cookies look amazing in all their ooey gooey molassesy-ness. Ha, I have TWO freezers. And they’re both full! Do you roll them in sugar before baking? The picture looks like there is sugar on the outside.